Deggendorf, Germany, 10 April, 2019 * * * congatec – a leading vendor of standardized and customized embedded computer boards and modules – will be exhibiting at Japan IoT/M2M Expo (booth 10-42 West Hall 2, 1F), showcasing its brand new demo platforms for the next generation of Artificial Intelligence (AI) based embedded vision systems. Designed in cooperation with and verified by leading ecosystem partners including NXP Semiconductors, Intel, Basler and Real-Time Systems, the platforms offer a new level of solution readiness for various AI based embedded vision applications. The goal is to minimize design effort for OEM customers and to ensure that new applications make it to market more quickly. Target industries range from industrial, infrastructure and smart city to logistics, vehicle and retail vision applications. Embedded vision that includes Artificial Intelligence is one of the most important growth markets in embedded computing. Customers in many different markets need to integrate AI and deep learning as well as camera technologies such as MIPI and real-time hypervisor technologies to consolidate real-time control and smart camera analytics on one single platform, explains Yasuyuki Tanaka, , Country Manager at congatec Japan K.K.. To simplify the use of our embedded computer technologies, we offer all that expertise together with our partners in comprehensive solution ready bundles. Our new demo platforms present an u nprecedented level of solution readiness, as everyone can see at the Japan IoT/M2M Expo. 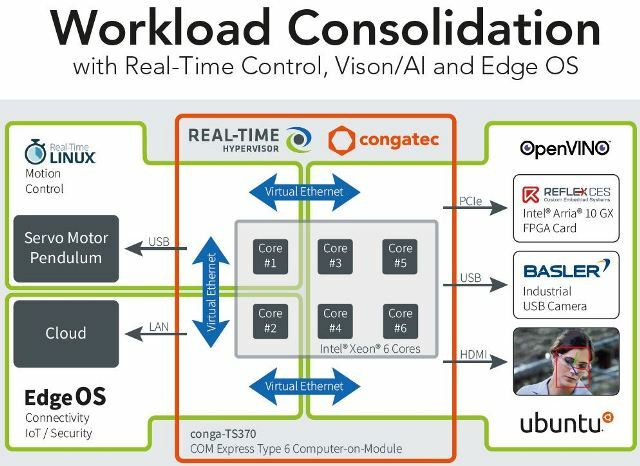 This greater solution readiness is the result of intensified cooperation with congatec ecosystem partners Basler and Real-Time Systems as well as silicon vendors NXP and Intel.